My family loves rice. I mean we could eat it every single night at dinner as a side. I make Instant Pot Brown Rice about three times a week. Cook your brown rice in 22 minutes and it comes out perfect. It’s my favorite. Let me show you just how easy it is to make! Add the rice and broth to the Instant Pot. 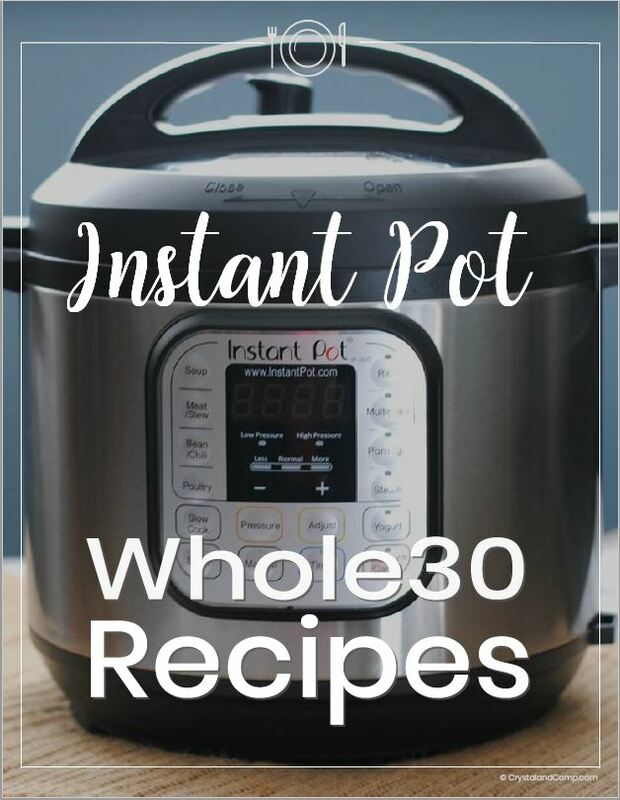 This is my favorite Instant Pot. I use the 6qt and it is perfect for my family of eight. Lock the Instant Pot lid in place, set vent to sealing. Set to manual function, high pressure, for 22 minutes. When Instant Pot beeps, let natural release for 10 minutes and then quick release. It is really that simple to make brown rice in the pressure cooker. I take any leftovers that I have and put them in a freezer ziplock bag. After each meal I just keep adding to the bag. Then, before long I will have a full gallon size bag of brown rice. You can heat it up in the microwave from the frozen state in just two minutes. I also love to add it to soups while it’s frozen. It makes dinnertime so easy. Rice is such an inexpensive side for any meal and brown rice is so much better for you than white rice. Here is one of my favorite recipes to serve with brown rice. 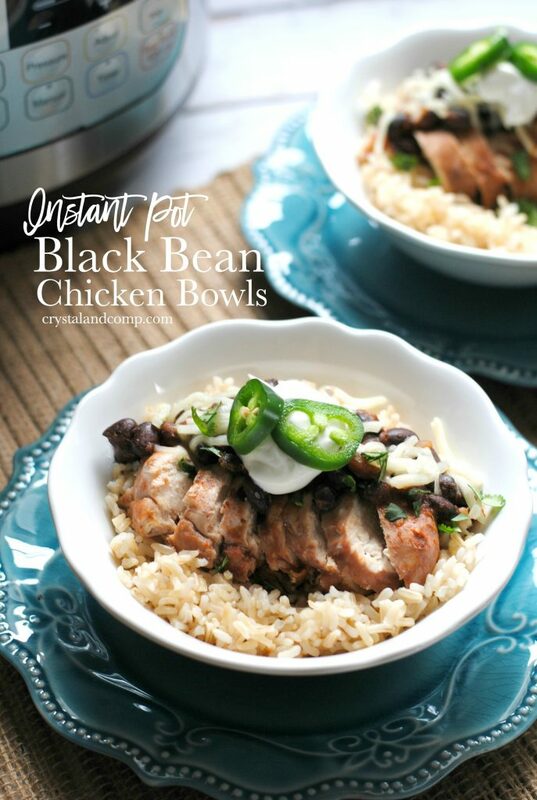 These Black Bean Chicken Bowls are amazing! 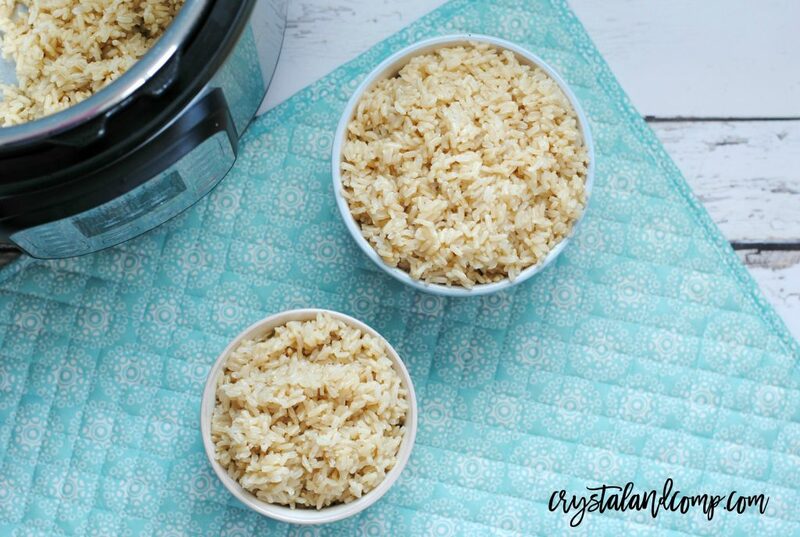 Have you ever tried making rice in the pressure cooker? Once you try it, you will never make it on the stove top again. Once you make brown rice like this you will never make stove top again! 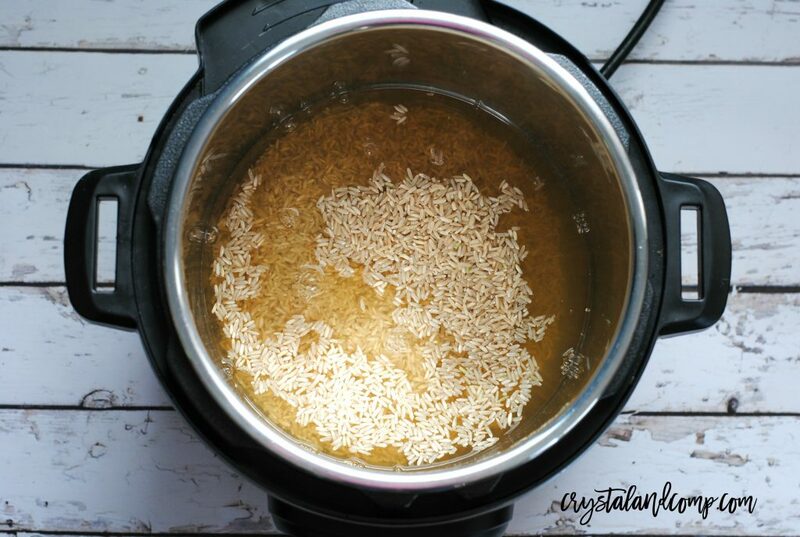 Add the rice and broth to the Instant Pot.Lock the Instant Pot lid in place, set vent to sealing.Set to manual function, high pressure, for 22 minutes.When Instant Pot beeps, let natural release for 10 minutes and then quick release.Fluff with a fork and serve immediately. Thanks for the handy tips Crystal! I’m still very new to cooking in my Instant Pot but so far I LOVE it! I’m also going to try out your idea for freezing the left over rice! I usually just pop it in the fridge but then if it doesn’t get used it goes to waste. Freezing it for soups or other dishes sounds perfect! Cooking rice is just not my thing. 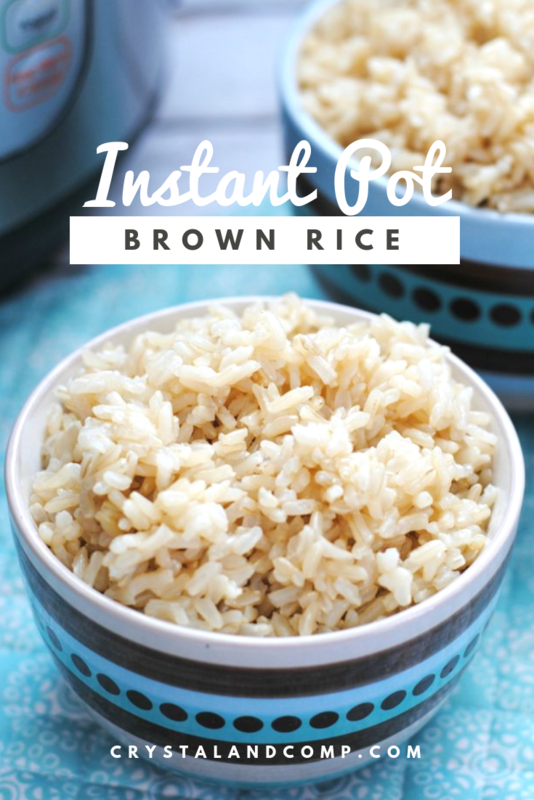 These easy instructions on making brown rice in my Instant Pot totally saved the day. Thanks so much! 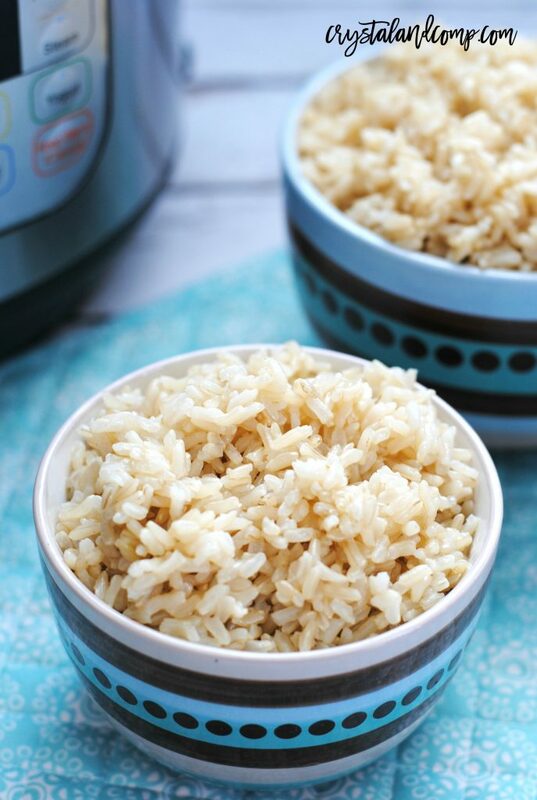 Love that you can cook brown rice in the instant pot! And I have never actually thought about freezing any leftover rice before but it’s such a good idea!